The best policy. | Team Effort! There’ve been a lot of conversations recently about how honest we can be on this blog. I for one, have had a draft blog post sitting on my desktop for the last two weeks about my own perceived inadequacy at administration. I understand that in order to genuinely assess and evaluate my progress throughout this year of development, I need to be able to look back at where I was throughout it, what I found difficult, what I was scared by. But you might be a potential boss one day, so if I say I’m a terrible… mathematician… that might cloud your judgement of me, whether it’s true or not, whether you’ve met me or not. I’m going to hedge my bets and assume that by the end of this year, I’ll be better at most of the things I tell you I’m bad at at the beginning. I’m also going to hope that you read these blog entries, by me and by the other artists involved in Team Effort! with an open and generous mind, that you don’t judge a group of people trying to learn from each other (and possibly from you someday) unfairly, regardless of the ramblings they engage in on the pages of this blog. With that in mind, I wanted to tell you a story about broken sleep. On Tuesday night, I was woken up when my elbow collided with my sleeping partner’s face. “OW! Why are you awake? ?” She said, semi-consciously. “I was thinking about different ways that we could use the spaces!” (I hadn’t been) I replied, animatedly. I then proceeded to reel off a series of words that were, for all intents and purposes, unrelated to each other. The only one I remember is “public”. Then I promptly apologised and fell back to sleep. This project, and the possibilities it creates, has completely overtaken every waking (and apparently every sleeping) part of my brain. I feel galvanised and energised in ways that I’ve rarely felt professionally before. I also feel a creeping sense of panic. This mild panic has been sneaking up on me for the last eight months or so. It started in the early days of Team Effort! when I was sitting with flip chart paper, pens and post-its in the inspiring, uber-supportive surroundings of the National Theatre Studio. It continued through summer, through to last week, when I sent out the contracts to the artists and to this moment, when I sit, scribbling this blog post down in a frantic, semi-legible scrawl in my notebook. One of the amazing things about Team Effort! is the lack of expectation that has been placed on it. This is not to say that people – the artists, the venue chiefs, the producers, the people at Creative Futures – don’t expect us to achieve anything. Rather, it’s that we are free to experiment, to reach conclusions and to explore areas that we wouldn’t have previously imagined we would. It’s also the fact that, unlike other artist attachments with more illustrious or more financially big-hitting companies, none of the artists involved in Team Effort! expect a commission, an exhibition or a album deal at the end of it. And none of the head honchos that support me and the project are worried about having to deliver that to the artists at the end of the year. If those things happen, it’s an unexpected bonus, but it’s not how we will determine the success or failure of Team Effort!. In fact, the only expectation being placed on anyone is the towering one that I’m putting on myself. But I understand that this is, mostly, a good thing. It forces me to strive, to work harder and to imagine things more creatively. At times though, this natural, healthy sense of ambition and expectation teeters over into panic. What if I fail them? What if I waste time? What if I waste money? What if people think I’m stupid/ineffectual/incompetent/boring? What if I fail to adequately address the needs of the visual artists because my experience is in performance? What if the project becomes exclusive or inaccessible or acquires the superficial, ephemeral gloss of “cool”? But I understand that mistakes are a natural part of any process. As a producer, I’ve been taught to prepare for any eventuality, to approach a project from every possible angle, to plan for unexpected outcomes, to always have a contingency. But what about when the project is devised to be inherently unplanned and unknowable? What about when chaos and mistakes are actually desirable? How do you create a contingency for unexpected answers to questions you’ve not even asked yet? 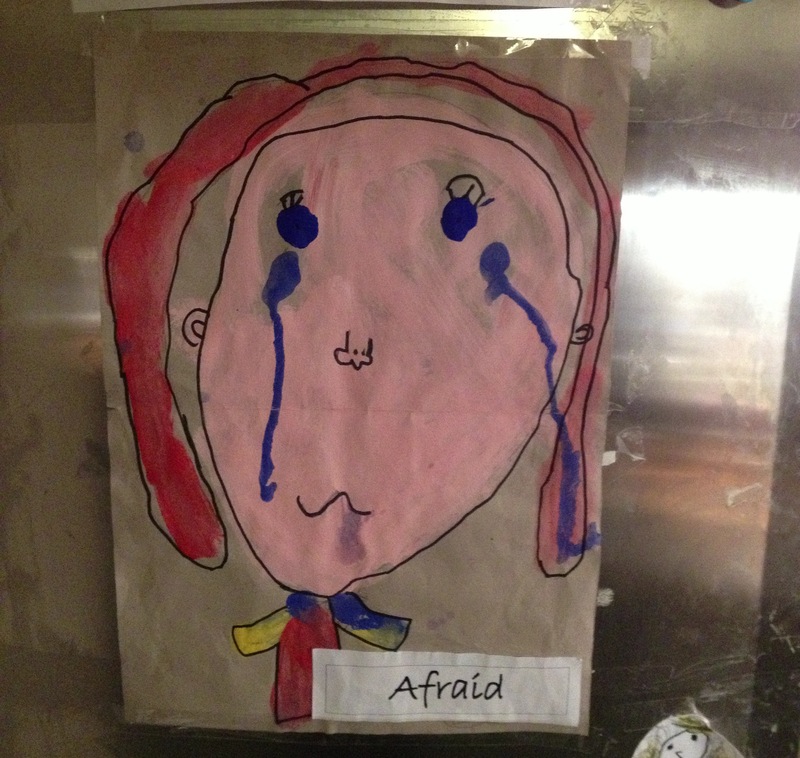 The photo that accompanies this blog post is possibly one of my favourite paintings ever (I told you my background wasn’t in visual art…) It’s by six year-old Ellis, who put big blue spots under the eyes of her portrait to represent tears. When she lifted the painting upright, the paint ran down the page – a totally unexpected outcome that shocked and upset the tiny painter until she was encouraged by her teachers, who explained that the paint running made the tears look more realistic, that the mistake made the painting better, not worse. I also know that if I wasn’t constantly asking all those questions (and others too) of myself, then it’s a sure fire sign that something’s going wrong. I know that, after our first full-team workshop on October 5th, these questions will become provocations rather than obstacles, they’ll open the floodgates of discussion and allow me to share the weight of them around the whole group. So I guess I’ve ended up back where I started. It’s really important that we feel able to be honest and open this year and to be able to share all of our questions, fears and aspirations with each other and with you. You might even be able to help with some of them. And, for the record, I am definitely getting better at maths.